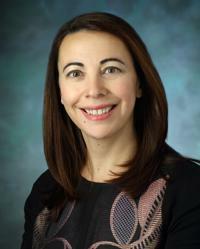 Irina Veytsman, MD, is a board-certified medical oncologist/hematologist at MedStar Washington Hospital Center’s Cancer Center and a Section Director of the Hematology/Oncology Department. She is a member of the American Society of Clinical Oncology and the International Association for the Study of Lung Cancer. Prior to joining MedStar, she served as Director of the Hematology/Oncology Department, Associate Director of Thoracic Oncology, and Director of the Infusion Center at PinnacleHealth Cancer Center in Harrisburg, Pennsylvania. Dr. Veytsman specializes in the treatment of lung cancer and head and neck cancer through the use of chemotherapy, immunotherapy, and targeted therapy, alone or in combination with oncological surgery and radiation oncology. She is part of the multidisciplinary team in Thoracic Oncology and Head and Neck Cancer at MedStar. Her interests include research studies of racial differences in tumor biology and treatments. She is particularly interested in understanding how lung cancer in women may be caused by other factors, such as hormonal influences and environmental exposures. Dr. Veytsman has previously served as the Chair of the Education Committee for the Head and Neck Cancer track with the American Society of Clinical Oncology, on the Communication Committee for the International Association of Study for Lung Cancer, on the ASCO 2017 questions writing panel, and has served as a member of the 2018 ASCO Educational Book Expert panel. She was principal investigator on multiple research studies and hopes to continue her research at MedStar. During her time with PinnacleHealth Cancer Center, she served on the Pharmacy and Therapeutics (P&T) committee, the Continuing Medical Education (CME) Committee, and the Institutional Review Board (IRB) Committee. Dr. Veytsman connects with physicians across the country and around the world in order to broaden the scope of therapies she can recommend to her patients. She has received the Washingtonian Top Doctor Award and was voted as an “All Star Physician” by Harrisburg Magazine 2016. Dr. Veytsman received her medical degree from Kazan State Medical University in Russia, where she also completed a three-year residency in internal medicine. She then continued her training in the United States at the University of Connecticut for a three-year residency in internal medicine before joining the National Institute of Health’s National Cancer Institute for a three-year fellowship in hematology and medical oncology. She is passionate about building a Thoracic Oncology Program that would include a new lung cancer screening program at MedStar Washington Hospital Center. This program will aim at catching lung cancer in its early stages, when it is more curable compared to late-stage lung cancer, and will include a pulmonary nodule clinic, tobacco cessation program, research trials that involve new innovative therapies, and studies in the underserved African American population. “I treat each patient as a family member. As a family-oriented person, I understand the importance of having a strong and supportive team by one’s side to help with decision making and to offer support. “Each patient is different and will present with unique challenges. I work with my patients to form a special bond that is based on the understanding of their desires as well as the profile of their specific cancer. The best treatment plan is built on a foundation of trust, communication, and knowledge.